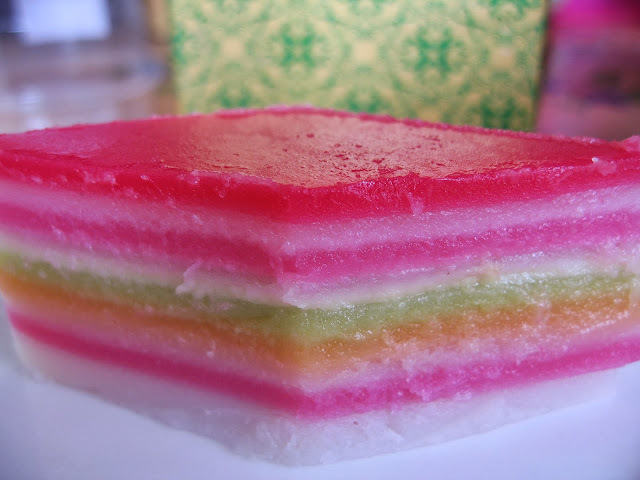 I made this kuih lapis to be offered among the foods which I have prepared as Thanksgiving at a Taoist temple. It is now fast approaching the end of the Chinese lunar calendar and it is time to offer prayers in gratitude for blessings from the deities for the entire year. This is my first attempt at making this kuih lapis which is a Malaysian delicacy using rice flour and coconut milk as the main ingredients. 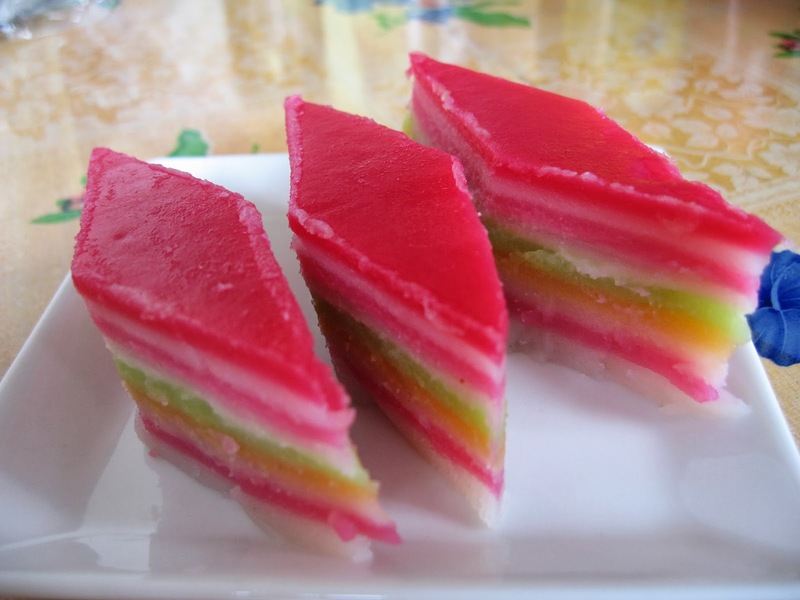 The santan or coconut milk and the pandan leaves made this kuih very fragrant. The Chinese refer to it as 'nine-layered cake'. I love to eat this by peeling off layer by layer to savour the fragrance and its sweetness. 1. Sift the two types of flour together. Add santan gradually to the sifted flour. Blend into a smooth batter. 2. Boil syrup ingredients over moderate heat till sugar dissolves. Strain the syrup and add hot water ( if necessary ) to bring it to 225ml. Pour hot syrup into the blended flour mixture. 3. Reserve about 160ml of batter and add red colouring ( this is for the top most layer ). 5. Boil water in a steamer. 6. Lightly grease a round cake tin ( 18cm diameter x 5 cm height ). 7. Place the cake tin in the steamer. 8. Pour in a white layer of batter and steam for 4 to 7 minutes till cooked. 9. Once the white layer is cooked, add in the pink layer and steam the same way. 10. Repeat the process with the batter, alternating the colours, layer by layer. 11. Use dark red for the top most final layer. 12. Cool cake completely (preferably overnight ) before cutting. Make sure each layer is thoroughly cooked before adding the next layer. The batter will become opaque once it is cooked. 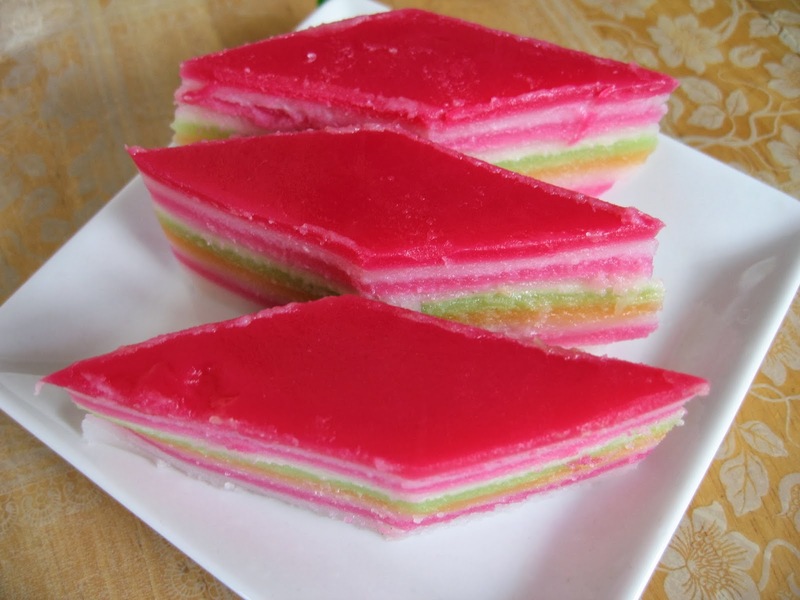 This is an evergreen kuih! Have not eaten or make this in ages! True, Evergreen and highly popular.